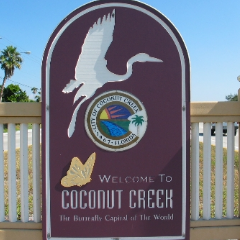 Coconut Creek is a well-planned city with a unique environmental consciousness nestled between Miami and Palm Beach – and known as the “Butterfly Capital of the World.” Spotlighted as one of the “Best Cities to Live in America” by Money Magazine and a​ ​Top Ten Place to Live in Florida by Movoto and NerdWallet. The City’s Mainstreet Project, home to the Seminole Casino Coconut Creek and the Coconut Creek Promenade, a 23-acre, open-air, upscale shopping and restaurant center, has received the “Award of Excellence” for its Design Standards by the Florida Chapter of the American Planning Association (FAPA). When complete, the City’s MainStreet area will be bustling with over 250 acres of LEED-certified businesses, upscale housing, and beautifully landscaped parks and greenways.